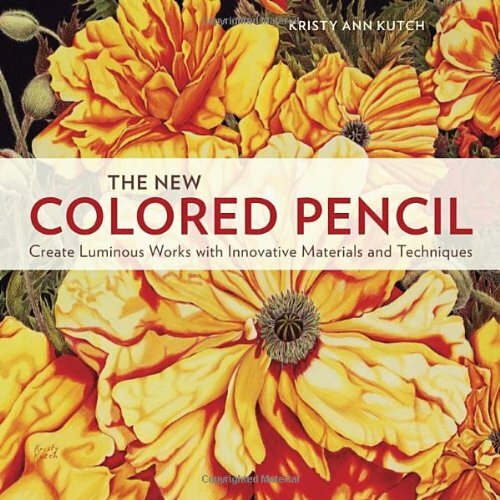 The New Colored Pencil works like a reference guide for beginners using coloured pencils. It's a good complement to the more structured coloured pencils instruction books. This book has a good coverage of different brands of pencils, talking about their pros and cons and quality. It includes more than just coloured pencils, but also goes into the different types of paper you can use, pastel pencils, wax pencils, watersoluble coloured pencils and many more. I'm surprised by the wide variety of products mentioned which is really useful information when you're a beginner and you're evaluating what to get. In addition to the interesting variety of art materials featured, there are several short tutorials on the techniques. These tutorials talk about the specific techniques, such as blending, creating a wash with watersoluble pencils, texture techniques, etc. They are not intensive multi-page tutorials, but they give you a good idea of the many techniques that you can use with coloured pencils. Overall, the book is really informative and up to date with interesting modern techniques and products. Highly recommended to coloured pencils users.